In any operation, one of the hardest things you will have to do is find space when there more often than not is no space to be found. This is where a pre built portable building office comes into the picture, and the usefulness of such a thing might actually surprise you. The first use we will discuss is that of an event which is happening or is about to happen. These are outstanding buildings that will serve your needs for a time, and can then simply be removed rather than left standing. The best part is that they can be re-used over and over again, moving to different venues, and then stored at a facility when they are not needed. Such modular office buildings can either be made from traditional materials such as wood and plaster, or they may be comprised of steel. Even more popular are the wood/steel hybrids which deliver the benefits of both. The choice is yours, but this is far from the only use for a building of this nature. While a concert or event might be a good occasion for bringing out a building like this, work sites are yet another that you might consider. 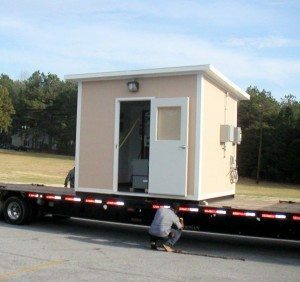 Construction sites have long used portable/modular buildings, mostly because they can take a beating and then be re-used at your convenience. In addition to that, they are cheap, meaning they can be deployed at multiple sites if the company finds it to be necessary. Something else to note is that modular buildings do not necessarily have to remain earthbound. Instead, they can be lifted up on scaffolds, not only giving the office workers a better view of the work site, but also allowing for dry storage beneath the office itself. This actually gives the building a chance to serve a dual purpose – something you may not often see at many rural construction sites. Having a modular office like this is far better than setting up a tent or using a trailer, and it will also be more cost effective. While the latter two might be cheaper at the outset, they stand a chance of becoming damaged much easier than a modular, and will therefore cost you both time and effort in the future – something that you simply do not want to deal with. A mezzanine is a second or third floor within a building that cannot technically be considered a floor. The mezzanine could actually be a balcony within a hotel or office building, but in this context we are actually talking about an elevated office building, typically modular. On the factory floor, it can be difficult to find space, especially if you have only one building in which to work with. A good use for a mezzanine would be to install an elevated office building, and by doing so you will actually create a nice storage area. Beneath the mezzanine you can place anything you want, and even create a storage locker if you so desire. In addition to being a sturdy structure, you have to consider the type of insulation these buildings need. While the vast majority of buildings will not require anything special, there are many factories and warehouses that can achieve extreme heat or extreme cold depending upon what is being done inside. That said, these modular structures desperately need to utilize the proper insulation and they need to be resistant to heat. This means not only preparing them for rising temperatures, but also the potential for fire. 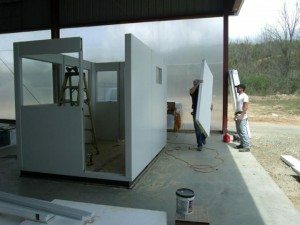 As you can see, there are plenty of things for you to consider when it comes to your indoor modular structures, all of which can be addressed by an experienced company. If you are looking for more space or even a place to set up your operation, then you need look no further than a manufacturer of modular office buildings. These buildings will easily provide you with the space you need and even provide shelter in case of emergencies. The best part is that they are not necessarily designed to be permanent. They can be disassembled at a moment’s notice and then reassembled in an entire different location if you wish. This is one of the greatest benefits to using these buildings, as you will quickly discover. After all, how often do you get to simply take a building with you? Manufacturers of metal buildings can provide you with not only the buildings you need, but also the security your company requires. You can feel free to choose from a pre-built structure or specify your own requirements with the understanding that it will cost a bit more to have such a thing requisitioned. There is plenty to consider, especially when it comes to choosing the design you really, truly want for your company’s modular office building. This is an outstanding solution and one that can serve your company will for many years to come. It won’t be long before you have one of these fine structures standing in your own work environment whether you choose to keep it confined to the ground or simply raise it to new heights.